Court rulings on permissible uses of eminent domain have changed over time. The evolution of this change at the federal level and within the Michigan courts is outlined below. Many of the Framers were heavily influenced by the writings of John Locke and considered property rights to be "natural rights," which are rights that are possessed by every individual and not dependent on the existence of government. But even at the time of the founding, the government could take private property if it was going to be used for the common good. Aware of the obvious tension between this government power and the individual’s right to possess, use and sell property, the framers of the U.S. Constitution put two limitations in the Fifth Amendment: first, that just compensation be paid for the property; and second, that the property be taken only for a "public use." "(T)he right of acquiring and possessing property, and having it protected, is one of the natural, inherent, and unalienable rights of man. Men have a sense of property: Property is necessary to their subsistence, and correspondent to their natural wants and desires; its security was one of the objects, that induced them to unite in society. No man would become a member of a community, in which he could not enjoy the fruits of his honest labour and industry. "The despotic power, as it is aptly called by some writers, of taking private property, when state necessity requires, exists in every government; the existence of such power is necessary; government could not subsist without it. … It is, however, difficult to form a case, in which the necessity of a state can be of such a nature, as to authorise or excuse the seizing of landed property belonging to one citizen, and giving it to another citizen. It is immaterial to the state, in which of its citizens the land is vested; but it is of primary importance, that, when vested, it should be secured, and the proprietor protected in the enjoyment of it." ± Madison and many of the other Framers had an expansive view of the term "property," using it to include not only an individual's physical property, but other individual rights, such as free speech, as well. Thus, when the Framers discussed the importance of protecting property, they were concerned with more than physical property, though they did consider that property extremely important. ¶ During most of the U.S. Supreme Court's first century, justices were basically required to travel independently to various states and work as judges in the lower federal courts. After the Civil War, America was expanding and industrializing. Many takings that assisted the development of the country’s infrastructure were permitted by state courts, and these takings often benefited private parties, such as privately owned railroads, utilities and mines. The takings were rationalized on the theory that "they afforded some general larger benefit to the public." As noted above, the Fifth Amendment of the Constitution (and the remainder of the Bill of Rights) did not originally apply to the states. It was not until the passage in 1868 of the 14th Amendment that the courts were legally empowered to "borrow" (or "incorporate," in legal language) the Bill of Rights and apply those rights against the state governments as well. Thus, it was not until a little over a century after the federal Constitution became effective that the U.S. Supreme Court began in earnest to discuss takings. Up until that point, most takings were made by state governments and were matters of state law. Once the federal courts began deciding eminent domain cases, they eventually allowed some takings for the development of infrastructure. In Clark v. Nash (1905), the U.S. Supreme Court upheld a taking of one neighbor’s land for another neighbor’s ditch, thereby making it possible for the second neighbor to irrigate his land. In Strickley v. Highland Boy Gold Mining Co. (1906), the U.S. Supreme Court upheld a taking that allowed a mining company to pass an aerial line for ore transport over an individual’s property to a railway station. The Supreme Court in Strickley held that in determining what constitutes a public use, the courts should not focus exclusively on whether the taken property was open to use by the general public. Generally, the courts viewed "public use" as being dependent on the specific facts of the case, rather than an easily defined general principle. This viewpoint led judges in succeeding years to defer to local officials, who typically had more knowledge of local conditions. ** The court discussed the due process clause of the 14th Amendment, not the Fifth Amendment's takings clause. In Kelo, the United States Supreme Court cited the 1897 Chicago B&Q Railway Company v. Chicago ruling (166 U.S. 226) for the proposition that the Fifth Amendment was incorporated against the states. A careful reading of the B&Q Railway Company decision casts doubt on the certainty implied by the Kelo court. Nevertheless, subsequent case law has clearly held that the Fifth Amendment is incorporated against the states. This view is now universally accepted and beyond argument. As the public-use requirement was being relaxed, many governments became concerned with the living conditions in urban areas. To remedy these ills, statutes were passed that gave municipalities broad powers to condemn neighborhoods to cure "blight." Often, blight was not clearly defined. Michigan’s blight removal statute, which is set out under "Property-by-Property Blight Assessment" on Page 16, is a typical example. Traditionally, eminent domain had been used as a means of creating something, be it a school, railroad, utility or ditch. But with blight, the power of eminent domain was being used to destroy a perceived social ill. The question thus arose whether property that was not in and of itself blighted could be destroyed in order to cure property that was. In Berman v. Parker (1954), the U.S. Supreme Court reviewed a case wherein Washington, D.C., which is legislatively controlled by Congress, wanted to redevelop a neighborhood that contained some blighted properties. The owner of an unblighted department store in the area objected that his property was going to be taken and turned over to another private owner. The Supreme Court unanimously held that unblighted property could be taken along with blighted property. The decision serves as the foundation for the Kelo ruling, and the ruling demonstrates how easily governments, even if prohibited from engaging in economic development takings, can achieve the same result merely by labeling such takings an effort to eradicate blight. "It is within the power of the legislature to determine that the community should be beautiful as well as healthy, spacious as well as clean, well-balanced as well as carefully patrolled. In the present case, the Congress and its authorized agencies have made determinations that take into account a wide variety of values. It is not for us to reappraise them. If those who govern the District of Columbia decide that the Nation’s Capital should be beautiful as well as sanitary, there is nothing in the Fifth Amendment that stands in the way. "Once the object is within the authority of Congress, the right to realize it through the exercise of eminent domain is clear. For the power of eminent domain is merely the means to the end. Once the object is within the authority of Congress, the means by which it will be attained is also for Congress to determine. Here one of the means chosen is the use of private enterprise for redevelopment of the area. Appellants argue that this makes the project a taking from one businessman for the benefit of another businessman. But the means of executing the project are for Congress and Congress alone to determine, once the public purpose has been established." Thus, in Berman, the U.S. Supreme Court deferred to local officials and held that blight takings could be made broadly, rather than on a particular property-by-property basis. In the 1984 decision Hawaii Housing Authority v. Midkiff, the U.S. Supreme Court unanimously upheld a state law that redistributed private property from a small group and gave it to numerous other individuals. Hawaii lawmakers were concerned that much of the state was owned by the federal government and a small number of private landowners, believing "that concentrated land ownership was responsible for skewing the State’s residential fee simple market, inflating land prices, and injuring the public tranquility and welfare." The Hawaii Legislature therefore enacted a statute which allowed certain tenants to petition for condemnation of the land they were renting and gain ownership of that same land after the government took possession. This was clearly taking land from one private citizen and giving it to another. Relying on Berman v. Parker, the Supreme Court unanimously upheld the statute. It held that courts should almost always defer to a legislative assertion that a taking is for a public use; in Midkiff, this legislatively determined public use was to cure the perceived societal ills of concentrated land ownership. The Fifth Amendment’s public-use clause was again at issue in the U.S. Supreme Court’s 5-4 Kelo v. New London (2005) case. In Kelo, the city of New London, Conn., was seeking to take a neighborhood not because it was blighted, but because if the neighborhood were redeveloped, the city would likely receive increased tax revenue. The city had received input from a developer and sought to condemn the property necessary to carry out the redevelopment plan. Among the properties to be condemned were the home of Susette Kelo and the home of Wilhelmina Dery, who was born in her house in 1918 and had lived there her entire life. The court’s majority upheld the takings. While the majority admitted that an indiscriminate taking that transfers property from one private party to another would be improper, it held that takings that reassign property to another private party do not violate the public-use clause when they occur pursuant to a redevelopment plan, rather than in isolation. The majority relied heavily on Midkiff, the Hawaii land redistribution case, and Berman, the Washington, D.C., blight case, and the majority held that economic development takings constitute a public use. "It is a misreading of Berman to suggest that the only public use upheld in that case was the initial removal of blight. ... The public use described in Berman extended beyond that to encompass the purpose of developing that area to create conditions that would prevent a reversion to blight in the future. (‘It was not enough, [the experts] believed, to remove existing buildings that were insanitary or unsightly. It was important to redesign the whole area so as to eliminate the conditions that cause slums. ... The entire area needed redesigning so that a balanced, integrated plan could be developed for the region, including not only new homes, but also schools, churches, parks, streets, and shopping centers. In this way it was hoped that the cycle of decay of the area could be controlled and the birth of future slums prevented’). Had the public use in Berman been defined more narrowly, it would have been difficult to justify the taking of the plaintiff’s nonblighted department store." Therefore, the U.S. Supreme Court held that under the federal Constitution, economic development takings and blight takings were largely interchangeable. In both situations, the Supreme Court held that federal courts must rule that development plans sanctioned by legislative bodies constitute a public use. Justice Anthony Kennedy, while signing the majority opinion in the case, filed a concurring opinion. He suggested that a higher standard of review may be appropriate if there are strong indications that a taking does not further a public use, but rather confers a private benefit. "Any property may now be taken for the benefit of another private party, but the fallout from this decision will not be random. The beneficiaries are likely to be those citizens with disproportionate influence and power in the political process, including large corporations and development firms. As for the victims, the government now has license to transfer property from those with fewer resources to those with more. The Founders cannot have intended this perverse result." Justice Clarence Thomas also filed a dissent, in which he echoed some of Justice O’Connor’s concerns. He also discussed in more detail the problems that takings similar to Kelo had caused for those less powerful in society. The majority opinion acknowledged "that nothing in our opinion precludes any State from placing further restrictions on its exercise of the takings power." The Kelo majority cited the Michigan Supreme Court’s Wayne County v. Hathcock ruling as an example of a state court decision that makes it more difficult for state and local government to use eminent domain. Any discussion of takings under Michigan law must begin not with Hathcock, but instead with Poletown Neighborhood Council v. Detroit. In 1980, General Motors Corp. informed Detroit that it would be closing an automobile factory that was located in the city of Detroit. GM offered to build a new plant in Detroit if a suitable location was found. The only area that met the criteria that GM provided was the Poletown neighborhood that straddled the cities of Detroit and Hamtramck. According to The Detroit News, this neighborhood contained approximately 4,200 residents, 1,300 homes, 140 businesses, six churches and a hospital. Not surprisingly, not all of the inhabitants of that neighborhood were willing to sell, and the use of eminent domain was necessary if GM were to acquire all of the land it wanted for its proposed factory. In a 5-2 decision that came only months after the case was originally filed, the Michigan Supreme Court held that the taking was proper. At the time, unemployment rates had reached 14 percent in Michigan, 18 percent in Detroit and 30 percent among Michigan blacks. The majority cited the economic benefits that the city claimed would come from the factory. "[T]he city presented substantial evidence of the severe economic conditions facing the residents of the city and state, the need for new industrial development to revitalize local industries, the economic boost the proposed project would provide, and the lack of other adequate available sites to implement the project. 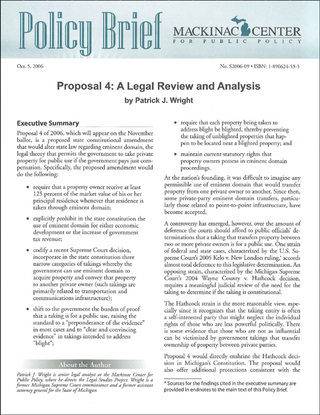 "In the instant case the benefit to be received by the municipality invoking the power of eminent domain is a clear and significant one and is sufficient to satisfy this Court that such a project was an intended and a legitimate object of the Legislature when it allowed municipalities to exercise condemnation powers even though a private party will also, ultimately, receive a benefit as an incident thereto. The power of eminent domain is to be used in this instance primarily to accomplish the essential public purposes of alleviating unemployment and revitalizing the economic base of the community. The benefit to a private interest is merely incidental." "The decision that the prospect of increased employment, tax revenue, and general economic stimulation makes a taking of private property for transfer to another private party sufficiently ‘public’ to authorize the use of the power of eminent domain means that there is virtually no limit to the use of condemnation to aid private businesses. Any business enterprise produces benefits to society at large. Now that we have authorized local legislative bodies to decide that a different commercial or industrial use of property will produce greater public benefits than its present use, no homeowner’s, merchant’s or manufacturer’s property, however productive or valuable to its owner, is immune from condemnation for the benefit of other private interests that will put it to a ‘higher’ use." Justice Ryan also dissented. He set forth what he believed were the three categories of permissible "public uses" that justify invoking eminent domain to transfer property from one private entity to another, and he noted that the Poletown taking did not meet any of these criteria. As will be discussed below, those three categories of uses eventually formed the intellectual foundation of the opinion in Wayne County v. Hathcock, a decision that overturned the Poletown precedent. Poletown served as a national model for other courts that sought to justify economic development takings. The Poletown ruling remained the law in Michigan until Wayne County v. Hathcock was decided in 2004, one year before the Kelo decision. In Hathcock, the Michigan Supreme Court considered the constitutionality of Wayne County’s attempt to, in the county’s words, "reinvigorate the struggling economy of southeastern Michigan by attracting businesses, particularly those involved in developing new technologies." Wayne County wanted, pursuant to Poletown, to condemn property so that it could construct a 1,300 acre business and technology park. Nineteen landowners refused to sell their property to the county. "Every business, every productive unit in society, does ... contribute in some way to the commonwealth. To justify the exercise of eminent domain solely on the basis of the fact that the use of that property by a private entity seeking its own profit might contribute to the economy’s health is to render impotent our constitutional limitations on the government’s power of eminent domain. Poletown’s ‘economic benefit’ rationale would validate practically any exercise of the power of eminent domain on behalf of a private entity. After all, if one’s ownership of private property is forever subject to the government’s determination that another private party would put one’s land to better use, then the ownership of real property is perpetually threatened by the expansion plans of any large discount retailer, ‘megastore,’ or the like." In contrast to the federal courts, which chose to defer to government officials in determining appropriate uses of eminent domain, the Hathcock court rejected the argument that Michigan courts should grant deference to a governmental claim of public use. The Hathcock court did not, however, set forth what burden of proof must be met in order to show that a taking is for a genuine public use. †† A number of federal eminent domain cases have been cited in this Policy Brief, but to date, the U.S. Supreme Court has not made an analogous attempt to categorize, as Justice Ryan did, all of the permissible public uses. As discussed below, these three uses would be incorporated (with modifications) in the Michigan Constitution if Proposal 4 were approved.